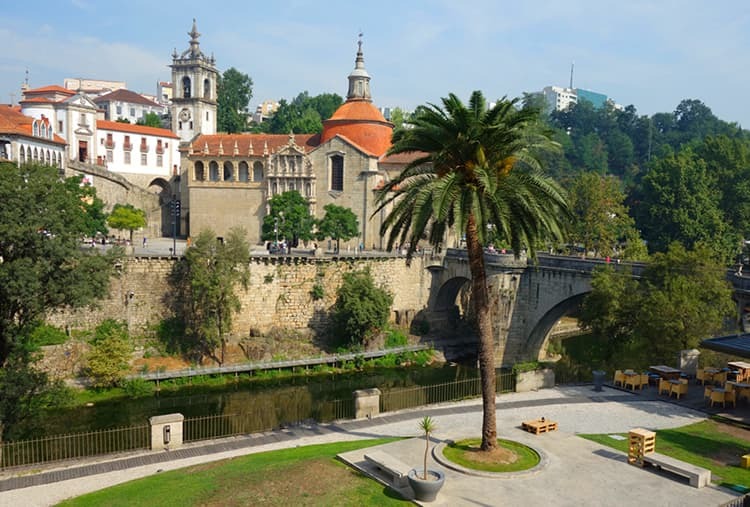 Have you ever heard of Amarante, Portugal? If you want to fall in love completely with the next city you are going to visit, I would suggest you visit Amarante. Its name comes from the Portuguese verb “amar” that means fall in love. And if you are wondering why, there are countless reasons. Amarante is located in the Minho region, the northern part of Portugal where it is produced the fragrant and delicious Green Wine (“Vinho Verde”), the light, sparkling wine of Portugal. So if you go there you will pass lovely nights, visiting the city with the taste of Vinho Verde in your soul. The second reason is the river Tâmega. It runs through the town giving the landscape a unique touch of beauty. You will spend hours staring at its fluid and clear currents. The third reason is the bridge built on river Tâmega called São Gonçalo bridge, that helped Amarante to survive French attacks in the 19th century. Walking on it, you will have the impression of being transported back in time, at the moment of the battle. What do you think now? Is it tempting enough? Or do you want more reasons to fall in love with Amarante? Don’t worry, there is so much we have to talk about. As I mentioned before, Amarante is located in the northern part of Portugal and it is a relatively accessible town. It’s lucky that it is super close to Porto. So, in order to visit this little pearl, you have to land to Porto (if you come from another nation, or very far away). Then, you will have four different options to choose from to travel to Amarante. Unfortunately, there is no direct train to take you there. Amarante’s railway station was closed decades ago (but there is a recent update: an amount of €118 million was recently assigned from the EU for the betterment of the efficiency of the trains in Portugal, so Amarante might be included in this plan since it is aimed mostly on the northern regions). In order to get to this little and cosy town, you might opt for the bus. I think it is the easiest and safest option. You just need to get on the bus, see the beautiful landscape of the Minho region, and then visit Amarante. Have a look at the route on the Rome2Rio site here as it’s the easiest to follow. Portugal offers many different options to move from a place to another, but this one, the bus, is fast (it takes just 50 minutes to reach your destination) and extremely cheap. You might find a ticket for just €10. If you don’t like to sit on the bus and stare at the world from its big window (and start to think about the meaning of life and how many bottles of Vinho Verde you are going to drink), you might opt for BlaBlaCar. It is surely a cheaper option than the bus since the average fare is about of €5, but it is not so easy to find a driver unless you go there in June, the moment where the city celebrates São Gonçalo. The time spent to get to Amarante is practically the same if you would have chosen the bus. Another option I would suggest to you is to rent a car. Indeed, this choice will allow you to travel autonomously and to craft your own personal travel itinerary, giving you the possibility to make different stops before arriving in Amarante (Portugal, and northern regions offer a lot of beautiful places from Aveiro, Portuguese Venice, to Guimarães, the place where Portugal was born, as a nation). Of course, it’s not the cheapest option, since you might expect to pay at least €15 a day for your car, but the freedom you will have in deciding your path makes it a worthy try. Another possible alternative is to take a private shuttle or a transfer. You will have to pay around €40, but you will travel alone, in all the comfort you can possibly imagine. There is no significant advantage considering the time spent travelling, it is probably expensive, but if you want to be comfortable, without much to think about than where you are going to dine, that is the option that I would suggest you. Try Get Transfer to find the best price. If you are arriving in Porto, you can take a guided tour with Get Your Guide who are safe, reliable and really well-priced. On this day tour from Porto you’ll visit the Vinho Verde wine region, admire the Atlantic-influenced landscape, and take in the stunning beauty of Minho, the setting for the Green Wine Route. Sample this fine young wine with some traditional local snacks and tour the city of Amarante and explore is medieval monastery and streets. To book this tour in advance, click here. So, these are all the possible way to get to Amarante. Portugal is tiny and you can opt for the cheaper solution, the bus that won’t’ take that much time to arrive at your destination. If I were you, I would pick this one, but I am a solo traveler and I do not care that much about comfort. If you travel with your kids or with the girl you want to marry, you might consider the other options in order to make the travel as smooth as possible. What’s the weather like in Amarante? Amarante is in the northern region of Portugal and unfortunately, it is very similar to the weather in Porto. The best season to visit Amarante, if you love hot climates, is without a doubt the summer. It is only during the months of June, July, August that you are going to find sunny warm days with an incredible amount of sunlight hours. I recommend just to keep in mind that the warmest month is August and that during this month the town might experience dry periods. Talking about the temperatures, on average you will find in June 17°C (63°F), which is still reasonable. If you decide to go there in July it will be around 19°C (64°F) and August will be around 25°C (77°F) with peaks of 33°C (91°F). If you want to visit this beautiful city in the winter, be prepared for cool temperatures and a lot of rain. December is the wettest month and January the coolest, so you should cross these months off if you love to sunbathe in warm weather unless you want to save some money since it is not too busy during this period. I just want to point out the fact that on average in this period, it is likely that the precipitation would be about 120 mm (with a peak of 133 mm in December). To give you a measure on how much it rains, anything above 100 mm is considered heavy rainfalls. If you opt for the spring months, you are likely to find chilly temperatures that will force you to dress with sweaters and a raincoat. The temperatures in March are on average 12°C (53°F), in April 13°C (55°F), and in May 16°C (61°F). It is still very rainy, particularly in March, where the rainfalls exceed the threshold for being considered heavy. It will be around 103 mm. Strange as it might seem, visiting Amarante during the autumn can be a very good idea. 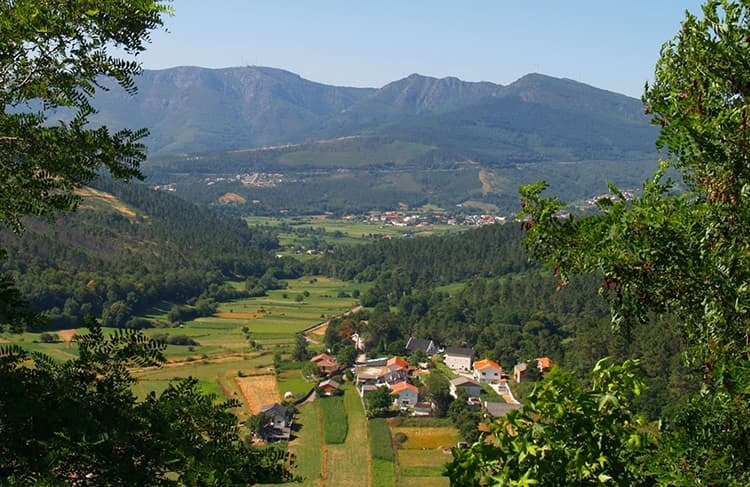 During this season, in the Minho region everything is prepared for Vinho Verde. So, if you love wine, colourful autumn landscapes and a temperature that could still be regarded as hot, I would suggest that you go there during this period. Indeed, in September you will find temperatures on average of 19°C (64°F) and in October around 16°C (58°F). Rainfalls are largely more than 100 mm. In September rainfall does not usually exceed 63 mm and October it’s around 68 mm. I do not know about you, but the most inviting season seems to be summer. Even though, you can enjoy the vibes of this town no matter how rainy it can be, considering all the attractions it provides. Find out more about the weather in all of Portugal here. Let’s talk about the things that make Amarante a unique place to visit. The most iconic attraction in Amarante is the São Gonçalo church (and, of course, the bridge that is just a few steps in front of it). Inspired by the Italian Renaissance aesthetic canons, the monastery is set in three tiers of columns decorated with Corinthian capitals. It is all made of granite, a stone whose colour will give you shivers during the day for its heavenly, pure white and, at the sunset, becoming as pink as the sky. Inside, you can discover the tomb of Gonçalo de Amarante, a priest beatified in the 13th century and protector of the town. In his honour, on his saints’ day in June, Amarante hosts big and outrageous celebrations. Well, the reason is simple. To celebrate the saint, according to the tradition, you have to give a phallus-shaped cake to the one you really want. And the theme of love is connected not only with the city (Amirante, amar, love), but also with the saint itself. According to the legend, in order to find the love of your life, you should touch the statue of São Gonçalo on New Year’s Eve. Anyway, if you want to visit the monastery and the chapel, it is possible throughout the year from 9am to 12pm or from 2pm to 5pm during the week. It is open from 3pm to 5pm during the weekends. The second iconic attraction is São Gonçalo bridge, the monument that, with the monastery, is present on any postcard of Amarante, Portugal. Created by the Romans to connect the town with Braga and Guimarães, it was rebuilt in 1763 following the Baroque and Neoclassical standards of beauty. At the beginning of each side, there is a memorial plaque where the echo of the battle against the French army can still be heard through the centuries. Without any doubt, it is the ideal place to take selfies because from the bridge you can take a stunning shot of one of Portugal’s, and possibly the world’s, most amazing townscapes. Church of São Gonçalo and bridge, Amarante, Portugal. Amarante was the birthplace of many artists. Among them, one of the most famous is Amadeo de Souza Cardoso (he is recognised internationally for his paintings inspired by the cubist movement). 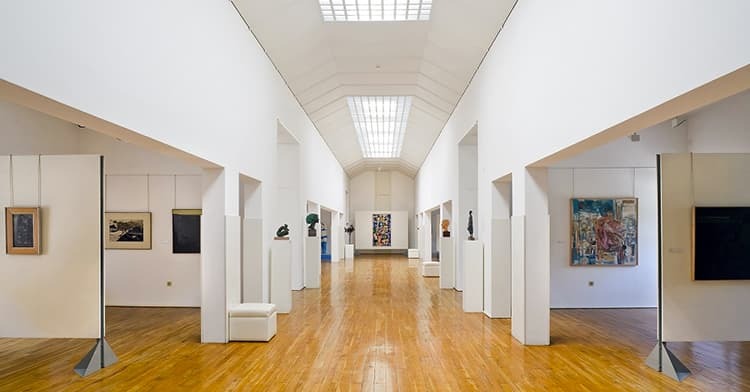 His works and some modern artists (like Modigliani and António Carneiro) are shown in the Municipal Museum (that was named after him to pay homage to the most important artist of this town). Focused especially on contemporary art, the Museum was created in an ancient deconsecrated church. During the winter is open from 09.30 to 12.30 and from 2 pm to 5.30pm. While in summer it is open from 10am to 12.30pm and from 2pm to 6pm. The ticket costs only €1, making the museum an attraction you cannot miss. If you like open air activities instead, Amarante has plenty of attractions you might like. You can have a nice, relaxing walk in the Parque Forestal de Amarante or go cycling on the Ecopista do Tâmega (as I mentioned before, the old railway station was closed during the 1990s and, after a process of renovation, it has become one of the most beautiful bicycle lanes in Portugal for its gorgeous landscapes). For the route between Amarante and Arco de Baúlhe, click here (website is in Portuguese). Or discover the Romanesque route, that passes through Amarante and the well-preserved buildings from the times of the Roman Empire. You can also lose yourself in the sensational mountain scenery of the Serra do Marão, the ideal place to do hiking and sightseeing. Of course, let’s not forget the Tâmega River which offers romantic cruises in summer, to fall in love with the city, your other half and the whole world. If you are convinced, and I bet you are, because a visit in Amarante sounds great, let’s talk a little about the place you should book to eat and to sleep in this beautiful, medieval scented town. Find out more about visiting Portugal by signing up for our newsletter today. If you plan a visit to Amarante, there are some unique and fabulous hotels that would rival the most expensive and exclusive hotel chains in the word. And also, the less expensive one can be regarded as a top quality hotel. One of the most famous and recognised is Hotel Casa da Calçada Relais & Chateaux , an astonishing, breathtaking, elite hotel that offers its customers a treatment fit for a King. 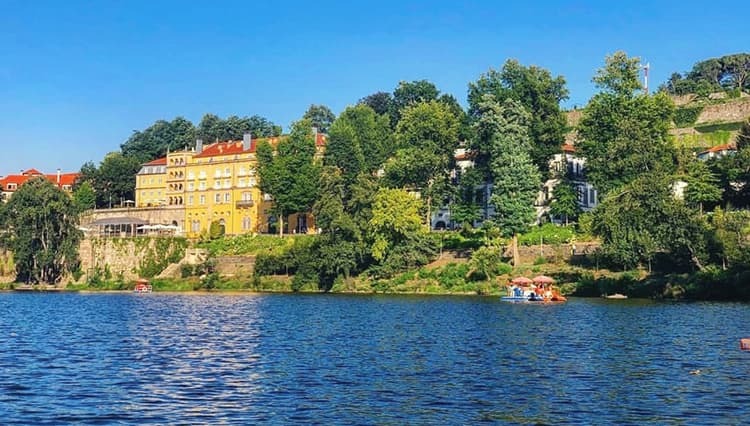 In the magical scenario of a 16th century manor, Hotel Casa da Calçada Relais & Chateaux has the advantage to be located in the centre of Amarante, having an exceptional view of Tâmega River. In addition to that, it also offers amazing facilities like an outdoor pool, free parking and a huge continental breakfast. Prices start at €197 per night. To book, click here. Another very interesting option is Casa do Ribeirinho. You can find this hotel almost in the middle of Amarante and enjoy its famous buffet breakfast or spend some time cycling or chilling in the hotel garden. It is almost sold out every month of the year so, if you opt for Casa do Ribeirinho, be aware that you might be required to book well in advance to avoid an unpleasant disappointment. Prices start at €48 per night. To book, click here. For those who do not want to invest a fortune in a hotel, but still wish to exploit some unique services, the most suitable option is Des Arts Hostel and Suites. With its garden and bar, Des Arts Hostel and Suites will give you the chance to collect some beautiful memories of your holiday. Considering that the hostel is located in a convenient location, it provides a set of guided trekking and open air activities and is therefore one the most popular hostels for backpackers. Prices start at €30 per night. To book, click here. If you want to enjoy the beauty of nature, the view of vineyards and the taste of homemade wine, the ideal choice for you is Monverde – Wine Experience Hotel. 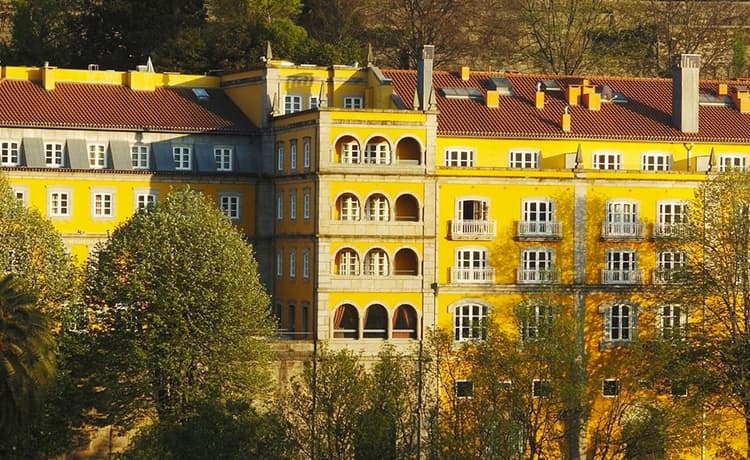 Despite being 20 minutes from Amarante, its unique services make this hotel a great choice for a serene stay. With its sauna, Turkish bath and indoor pool available freely, Monverde will help you relax and make the most out of the money spent for your holiday. Prices start at €126 per night. To book, click here. And what if you travel as a couple? What if you do everything together? No worries, there is the perfect solution also for this scenario. Quinta de Ribas offers a wide range of services like an outdoor swimming pool, a relatively big garden and a perfect location in the middle of Amarante. Quinta De Ribas is the ideal alternative for a romantic stay, at a very reasonable price. Prices start at €117 per night. To book, click here. What if you are hungry or you just want to dive deeply in the culinary culture of Amarante? What are the best restaurants in Amarante, Portugal? Among the options you can choose from, there are some very nice restaurants with stunning views of the city. One of the most famous is Restaurante A Eira, specialising in Spanish and Portuguese cuisine with a set of services like outdoor sitting, free parking and a very big bar, it will make you dine a dream. Another very elegant option is Largo do Paco (website is in Portuguese), a very fine and sophisticated restaurant where you can taste typical Portuguese dishes (I would recommend this especially to people that are willing to pay for quality food since it is expensive). If you want to experience Portuguese dishes recognised for their taste in all the northern region of Portugal, I would suggest giving Tasquinha do Ponte a try (it’s also very cheap) or Restaurante Pena. If you instead want to dine with an astonishing view of the Tâmega River, Pobre Tolo (website is in Portuguese) is the option you are searching for. These are only the most popular options of Amarante. I am sure that because of the beauty of the city, its unique architecture and its incredible Vinho Verde, you are going to enjoy every meal and happy hour. It’s the atmosphere that makes the magic. Is it worth going to Amarante, Portugal? Amarante is a very cosy, beautiful, typical town that is conveniently close to some of the most beautiful places in the world. Douro Valley, Minho region, Serra do Marão are the perfect places to dive completely into nature and forget the fast pace life we are sometimes forced to live. It is the ideal destination for those who seek a relaxing holiday and the possibility to discover the northern region of Portugal since it’s very close to Braga, Porto and Vila Real. Are you still reading? I don’t want to pressure you, but as I said, if you want to go there (especially for some hotels) you need to book well in advance. Amarante, Portugal, sun, wine, relax. what are you waiting for?